Nothing says summer like watermelon and mint. Watermelon is a summer staple – so juicy, diagnosis sweet and refreshing. Ricotta salata is a firmer, saltier version of standard ricotta and resembles feta in texture, though it’s slightly creamier. It’s also the perfect contrast to the sweet melon. I love this salad because it’s so versatile. You can serve mini versions as an hors d’ouevre as I did on Saturday night. Or as an appetizer, snack or even dessert. Depending on how your serving it, you can season it differently. If you’re going savory, drizzle the salad with some good-quality olive oil and a pinch of salt. If you’re serving it as a dessert or snack, drizzle it with honey and a sprinkle it with a coarse, finishing sugar. Either way, it’s a delicious and unique salad perfect for hot summer evenings. 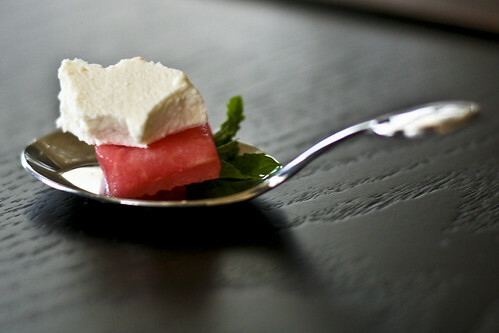 Gently toss the watermelon, ricotta and mint together, then drizzle with the olive oil OR honey and sprinkle with the salt OR sugar. 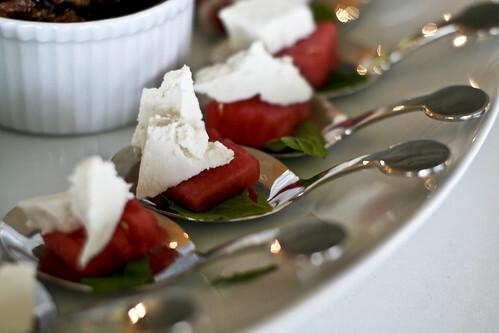 Wow i like watermelon, ricotta salata & mint salad. which may require special skills or understanding, for example, a game of chess. mission statements and an assessment of customers’ expectations.